"With a simple phone line, a modem, and a home computer, anyone could set up an Electronic Bulletin Board System, or BBS. At a time before flat-rate calling plans, before DSL and Cable Modems, people would call each other's computers one at a time, leave messages for anyone else who called after them, and build entire subcultures that had few rivals in complexity and depth. From these first few steps across the electronic landscape, an entire generation started to grow up online. They knew then what so many are learning now: the thrill of communication with others like themselves, around the country and the world. They overcame financial and societal obstacles and forged many of the same paths now crossed easily by the internet generations. They made friendships to last a lifetime. And they changed everything." If you're already registered, please enter your nom de modem below. Otherwise, please enter your real first and last name to begin. That's what The Belching Dragon's front door used to look like, anyway. 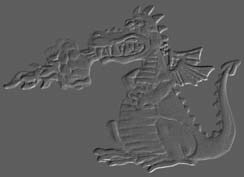 The Dragon was originally a single-line hobby BBS, set up on a donated Tandy PC with a meager 20M of hard drive space, running donated BBS-PC software over a 1200 baud modem. It started as a private system for the gamers participating in a long-running Dungeons & Dragons campaign. Hendel Thistletop was the name of my halfling character in that game, and his plan upon retirement from adventuring with Fortune & Glory was to open a tavern - The Belching Dragon. After a few months I decided that so much hardware and customization effort was being decidedly underutilized by a handful of gamers, and on December 14, 1988 the system was opened to the public. anyway - perhaps you'll be surprised by what you find here. created and sustained The Dragon through some very good years indeed. first or last, a single link broken from the chain serves little purpose. no more than that, and it is long past time to write the final page. whole rowdy lot of you. suggestions (graphics, applets, coding and layout advice, whatever). as well. We hope to see a lot of familiar faces in new surroundings. you tread leads to our doors once again. Activity continued to dwindle on ChainMail, and most of the Links gradually dropped offline. The Mystic Keep finally closed it's doors with this announcement a little over a year later, ending the BBS phase of ChainMail's history. to pay online fees to a big corporation. I found the Belching Dragon. change, expecting the people to return. I was wrong. the person that set everything up and takes care of it day in and day out. Sysop that does their best to try and follow those changes. I woke up. messages, more files, to move mail as quickly and efficiently as possible. of the modems making and breaking connections. All of this will soon end. be able to make changes on their end. with most people, I too am transfering my online presence to the Internet. meeting places may be no more, we needn't lose touch altogether. Still interested in (or nostalgic for) the digital Dark Ages, before the Internet Renaissance? Here are a couple of links for those with an interest in discovering (or reviving) what it was like being online, "back in the day." Back in the day, there were boards. Bulletin Board Systems. BBS's. No Net, no Web, no cyberspace, nothing. Just boards, and their ugly stepchildren, D-Dials. All strung together with phone lines, hand-rolled software, and 8-bit computers. No backbone, no hubs, no routers, no DNS tables. Just one computer picking up the phone, calling another, and having a little chat. What this site offers is a glimpse into the history of writers and artists bound by the 128 characters that the American Standard Code for Information Interchange (ASCII) allowed them. The focus is on mid-1980's textfiles and the world as it was then, but even these files are sometime retooled 1960s and 1970s works, and offshoots of this culture exist to this day. I propose to film and edit a documentary about all the aspects of the Bulletin Board System and its place in human history ... This documentary can be the way to tell later generations what the BBS was and what happened to the people who used it, and why the entire world changed at 30 characters per second.